Wearing your wedding ring in the workplace is a necessity but in some work environments rings pose as a very dangerous risk. Assess your risk factors at work to see if an Aeon Ring is right for you. An Aeon Ring allows you to display your marital status while protecting you from unsuspected hazards in the workplace. Danger is presented in various ways especially when working around moving parts or machinery. 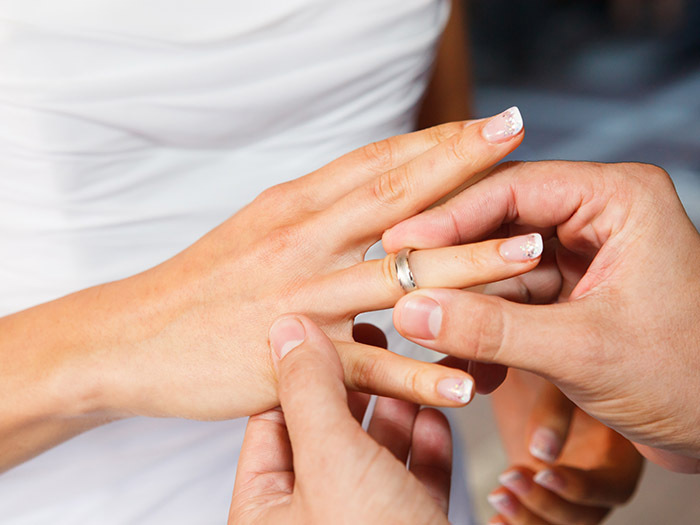 Wedding rings can pull the wearer into moving parts, injuring the wearer. Should it catch on an operating control such as a control lever, the ring could start machinery, creating danger to others as well as the wearer. An electrocution risk exists when jewelry made of conductive metal is worn around live current. Section 1910.333(c)(8) of OSHA Standards for Electrical Workers specifically prohibits the wearing of conductive jewelry in such a situation unless it has been made non-conductive by wrapping or some other type of insulation. Workers subjected to high intensity lights or other heat sources should exercise caution in choosing metal rings. Metal can transfer heat to skin, resulting in a burn. Rings can create several safety hazards for those working around chemicals. A spilled or splashed caustic chemical can get under a ring burning or irritating the skin.In addition some chemicals, particularly chlorine and ammonia, can damage silver or gold jewelry. Many food-handling companies prohibit the wearing of jewelry for sanitation purposes. Rings provide hiding places for bacteria that may cause food-borne illness. Some food preparation companies allow a wedding band if the worker wears a glove to cover it, but in a food-processing plant gloves may not be an option, so all jewelry usually comes off before the employee enters the work area. Copyright © 2018 Aeon Rings. All rights reserved .